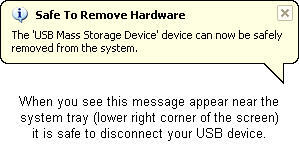 Double-click on the Remove Hardware icon located in the System Tray. A window containing a list of the USB devices will appear. 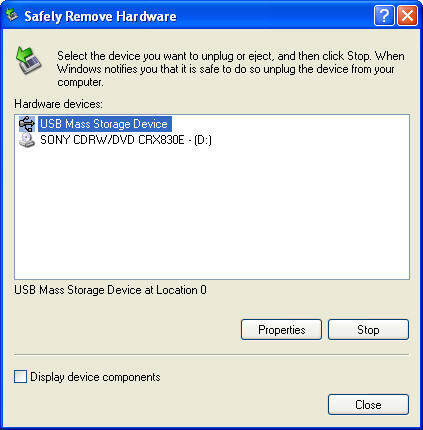 Left-click on the Safely Remove Mass Storage Device line that matches your flash drive (for example, Safely Remove Mass Storage Device – Drive(G:)). When you see a bubble message appear that says “Safe to Remove Hardware”, it is, as it says, safe to remove the flash drive from the USB port; you may close the message or ignore it, as it will close itself automatically. At that point it is safe to turn off and remove the device from your computer.